A roundup of media interviews, news releases, market data, background information and more. President Trump said Thursday (4/4) that he would delay by one year action on his threat to close the border with Mexico. The announcement defused a potential nightmare scenario for U.S. dairy suppliers. Mexico is a vital trading partner that bought $1.4 billion in U.S. dairy products and ingredients last year. The U.S. Dairy Export Council (USDEC) takes anything affecting trade at the Mexican border seriously and will continue to monitor the situation, tapping information from sources in Washington, Mexico City and elsewhere. Some USDEC information is for USDEC members only and can be found on this password-protected page. Other information, available to a broader audience, is aggregated below, providing a roundup of interviews, news releases, facts and more pertaining to U.S. Dairy and its trade with Mexico. 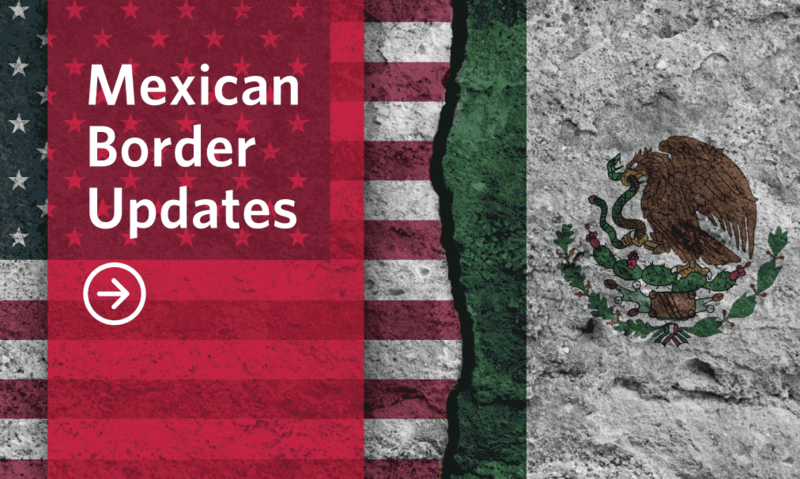 SUMMARY: Although President Trump has delayed a decision to close the border with Mexico, USDEC President and CEO Tom Vilsack reiterates the economic damage such a closure would create. "Farm income would be impacted, jobs would be impacted and the relationship between the two countries would be impacted," he tells CNN's "Quest Means Business." SUMMARY: Quotes U.S. Dairy leaders, including USDEC's Tom Vilsack, about the damage a border closure would cause. SUMMARY: Vilsack describes how devastating denying access to Mexico would be. Border Closing "The Last Thing This Industry Needs" (4/3/19): Nearly 30 percent of U.S. dairy exports go to Mexico, amounting to about $3.8 million daily, USDEC President and CEO Tom Vilsack tells RFD-TV. SUMMARY: In a 10-minute interview, Vilsack explains the dynamics of the situation in Mexico as well as other trade policy challenges. Closing Mexican Border Would Devastate U.S. Dairy (4/3/19): USDEC President and CEO Tom Vilsack explains during an interview with Adams on Agriculture how closing the border with Mexico would be "incredibly disruptive" to the U.S. dairy industry. SUMMARY: In a joint news release, USDEC and NMPF are among the first agriculture organizations to speak out about a threat to close the border. SUMMARY: Fast facts about doing business in U.S. Dairy's largest export market. In 2018, a record 15.8 percent of U.S. milk production was exported. Mexico was the largest single customer for U.S. dairy exports, with sales of $1.4 billion, up 7 percent from 2017. Every $1 of U.S. dairy exports to Mexico generates $2.50 of economic activity in the United States, according to a study by Informa Economics. Each day, an average of over $3.8 million in U.S. dairy products cross the border into Mexico. Mexico comprises roughly 25 percent of all U.S. dairy exports, which totaled $5.59 billion in sales in 2018. Mexico has been a vital partner in helping to increase U.S. dairy exports 619 percent since 1995. SUMMARY: Past articles providing relevant background information.